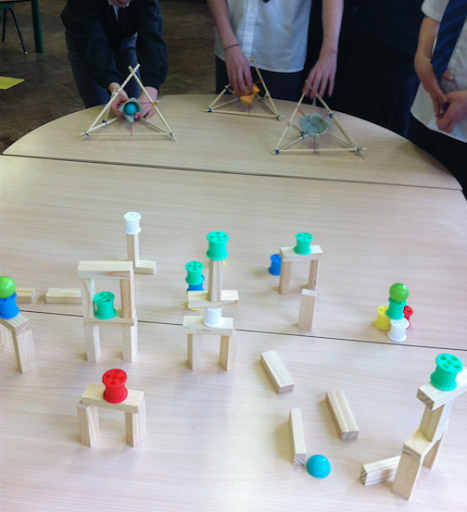 For my final activity idea for the week – Angry Birds Catapult *- I must give full credit to Phil Robbins, the STEM Ambassador who co-ran the Pixies Hill STEM Club with me for 2 years. I realise Angry Birds is a bit out of fashion these days, but this is a great build-and-play and gives the chance to learn about so many physics principles while you do. We actually ran this session with a different construction technique and using part of an egg box as the launcher for the catapult. We set up blocks (previously used for Jenga bridges) and cotton reels (previously used for cotton reel tanks) for the angry birds (decorated ping pong balls) to be launched towards. The children had great fun and it was a very popular session but, ever the engineer, Phil wasn’t satisfied and worked on the catapult design to make it more reliable and robust. 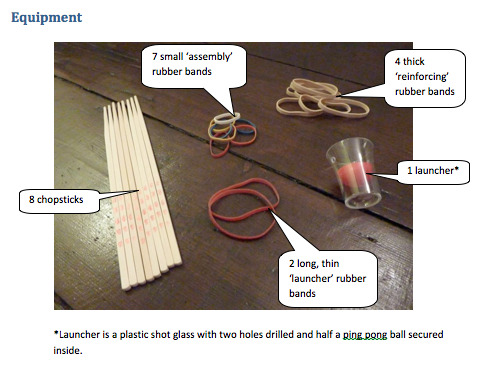 Not only will this prevent upset due to breakages, it will also enable the children to learn more – if a repeatable action creates a repeatable outcome (such as pulling the launcher back at a certain angle sending the ball a certain direction) they are better placed to understand the relationship between the actions and outcomes. We would love to hear of someone giving this a go. Please post pictures! If you don’t have access to a shot glass or the means to drill holes in it, you can always resort to egg box sections …..
* I’m not sure why the annotations don’t show up well when I look at this document online, however, when it is printed out, all seems to be clear and legible! Free workshops in Herts & Dorset: booking now! Copyright © 2019 The School Gate SET. Powered by WordPress. Theme: Spacious by ThemeGrill.